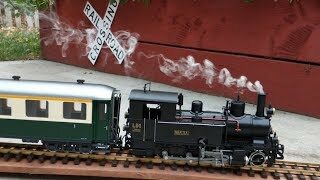 This big model train set has the most amazing realistic steam effect I’ve ever seen! For Christmas 2017 I added a 9th g-scale locomotive to my collection: a limited-edition LGB steam train modeled after the Rhaetian railroad of Switzerland. Only 399 of these locomotives were manufactured by LGB at their factory in Hungary. This is a very cool locomotive… the only one in my collection with puffs of steam from the smokestack that are synchronized to the sound of the locomotive and the speed it is moving. The steam/smoke also is released at track level, just like on a real steam train. The LGB model number for this locomotive is 20273 and the passenger cars are models 31522 and 32522. The locomotive runs on a digital (DCC) power system which allows multiple locomotives to run all at the same time on the layout, with individual control possible from a cell phone or tablet.